A very important resource for Irish genealogical research in the state of Kentucky is the Kentucky Irish American newspaper. Statewide newspapers aimed at the Irish community, and that were published for decades, are not that common. This publication hit the newsstands on a weekly basis from the 1890s to 1968. Based in Louisville, it catered to the needs of the concentrated Irish community. In the early decades there was regular reporting on fraternal organizations, such as the Ancient Order of Hibernians, with members and officers named on a weekly basis. Other features included society news, focusing on the burgeoning middle-class Irish, and deaths that occurred. 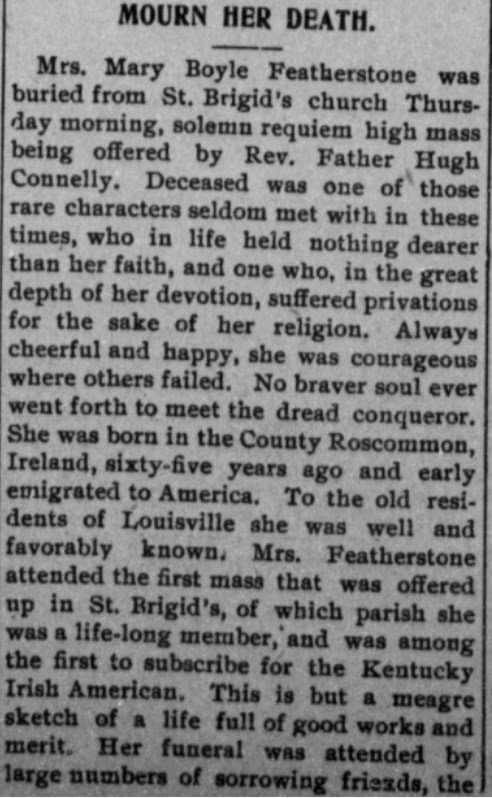 Some obituaries, such as the one below, for Mary Boyle Featherstone, give a county of birth. Microfilm editions for all years are available at the University of Louisville. Some years (1900, 1901, 1909, 1910) are available on the subscription website Fold3. Copies from 1898-1921 can be accessed for a fee on Newspapers.com, and for free on The Chronicling America website. http://chroniclingamerica.loc.gov/lccn/sn86069180/1905-03-11/ed-1/seq-1/#fullscreen=true: accessed 17 March 2014.